I recently opened a free Bitcoin wallet with Coinbase as a way of having options for safely transferring money with international sources without revealing personal account information. While I haven’t used it yet for the purpose of funding binary options experiments, I wanted to begin exploring how Bitcoins work as a viable option for the future. After I obtained a wallet and made my initial purchase of some Bitcoins, it was time to practice sending and receiving funds. My desire to experiment lead me to the site satoshimines.com. 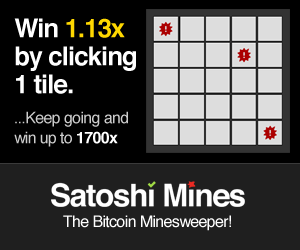 It’s a simple gaming site with only one game that offers you a chance to win Bitcoins with a platform similar to the old windows Minesweep game. I don’t expect to really make any money from this site, and would advise you to play with caution, as this clearly ventures away from investing into gambling. If you have a gambling addiction or a tendency to bet emotionally, this is not for you. For the purpose of experimenting with exchanging funds, satoshimines.com was a good option for me. This site reports to and appears to operate according to statistical probability. Although I am always skeptical that sites of this nature may be rigged and have a way of intervening if you prove to be too “successful.” If anyone has any experience using satoshimines.com, please send me some feedback. I am too new at this site to offer an experienced-backed opinion. I made yet another discovery that has led my to share my story with you regarding satoshimines.com. There are scripts readily available that allow you to implement a robot to perform the gaming on this site on your behalf. While this differs from the robot trading used in the Binary Robot Project, there are some similarities that intrigue me. In particular, the script allows some parameters similar to the Martingale approach. Will this be enough to turn a profit? Is random statistical probability equal or greater than the signals method used to predict the probability of binary options by our binary options robot? We’ll see. While my exploration of this site and the subsequent script-based robots is still in it’s infancy, I don’t think this is the last time you will hear me reporting on this topic.